Lake Tahoe is a fresh water lake in the Sierra Nevada. It is on the borders of the states of California and Nevada, in the United States of America. 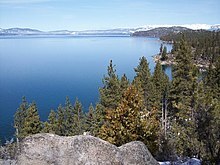 Lake Tahoe is one of the deepest (1645 feet/501 m), largest (192 sq. mi./497 km²), and highest (6229 feet/1898 m) lakes in the United States. Only Oregon's Crater Lake is deeper at 1930 feet (588 m). The lake is a popular place to spend holidays both in summer and winter. This page was last changed on 28 April 2014, at 04:08.